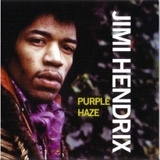 The Jimi Hendrix Experience-"Purple Haze"
Okay, maybe this one has been done to death, but in 6th grade I really did think he said "Excuse me while I kiss this guy." And it wasn't so much the meaning of that one line that eluded me, as much as it was the whole song. But mostly I just wanted to know what the heck purple haze was. I liked Prince, but if it was anything like purple rain, that would have only added to my confusion. I had no idea (and still don't) what that’s all about. I asked my mother what purple haze was. She told me it was a Jimi Hendrix song. Ahh, gee mom, thanks for the help. So I asked my dad one day while we were driving across country. He had been to Woodstock; certainly he must know. He replied, "Purple Haze? Ahh, it's an acid rock thing. You won't understand now, but you will someday." He paused for a moment, as if having a flashback, and then continued, "It's, you know, really head-y stuff." And as he said this he lifted one hand from the stearing wheel to the side of his head and made an egg-beater motion. Err, okay? I eventually moved on to punk rock and rap, and forgot about Hendrix or "Purple Haze" or any "head-y stuff" until several years later. One night in a nebulous college dorm room with Jimi on the stereo I finally figured it all out. Ohhh, he's saying “THE SKY," not "this guy." And at that very moment, about an hour into my first experience with a mind-altering acronym—kissing the sky, if you will—I finally figured it all out. "Purple haze all in my brain..."
See what else made the list after the leap.